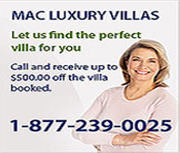 During the past ten years, MAC Caribbean has earned a reputation for honesty and integrity by providing clients with an excellent selection of luxury villa rentals in the Caribbean. Based on first-hand knowledge of St. Martin/St. Maarten, they will candidly assist you in finding the best Caribbean rental to fit your needs. In support of the newly redesigned Caribbean website, MAC is offering a free car rental with every villa reservation made in the next 30 days. Don’t miss out – this offer expires April 30, 2013! Contact us today at (416) 222-0025, 1-877-239-0025, or info@macsuites.ca.